I'm seeing stars this week! After a two-week hiatus from my weekly Spotlights, it's finally January! I have my work cut out for me on the New Release Spotlights this month. 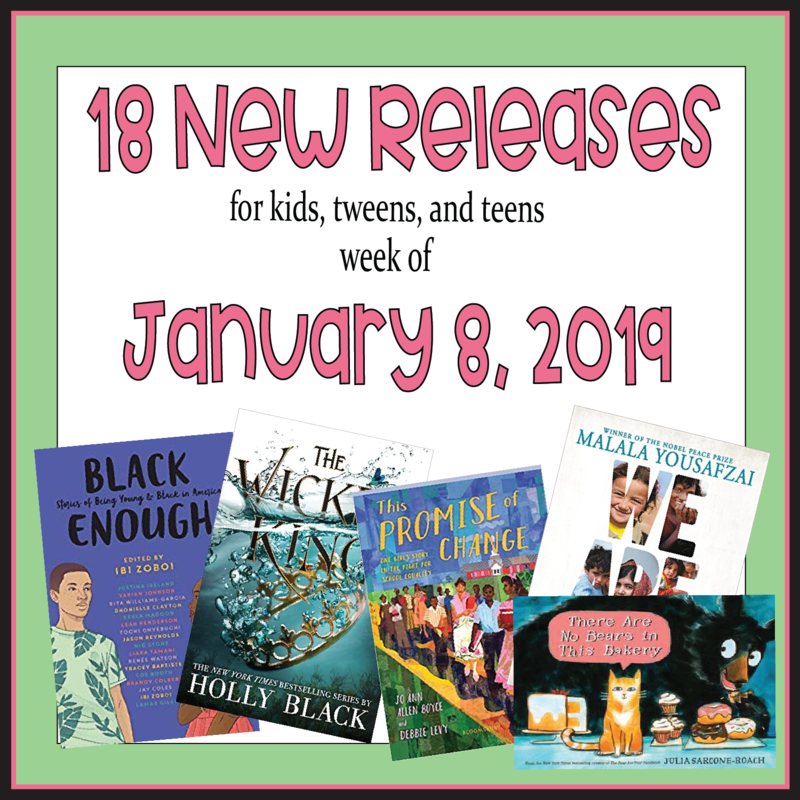 January is always a big month for new book releases, and you won't believe the number of starred reviews on this week's list. 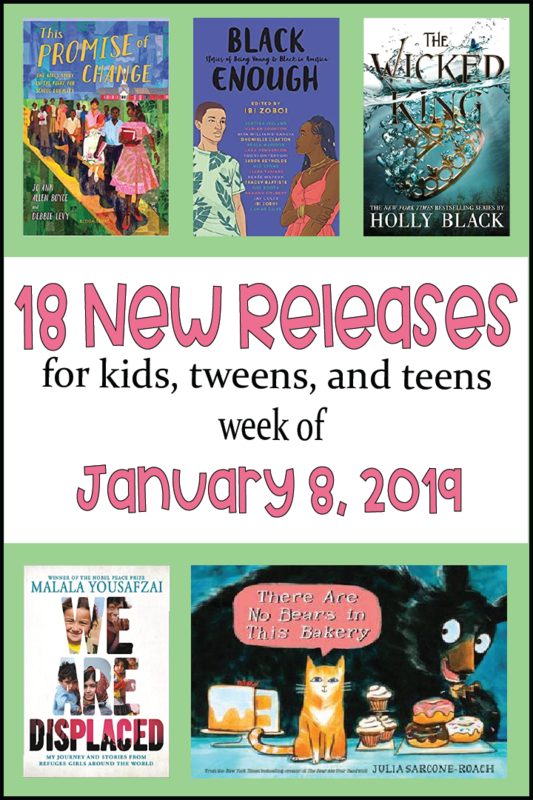 There are new titles from Malala Yousefzai, Kiersten White, Ibi Zoboi, Carole Boston Weatherford, Patricia McKissack, Jonah Winter...and let's not forget a little sequel from the author whose writing I've called "buttercream frosting"...Holly Black. In total, there are FIVE TITLES (!!!) this week that received three (or more) starred reviews, and nearly all of them received one or two starred reviews. I feel like I'm in a Lucky Charms commercials with all those purple stars I'm seeing! Back in December, I tried doing a New Release Spotlight giveaway each week. I loved doing that! The New Release giveaways have been super-easy to arrange, so I plan to continue them in January. I can't promise to do them forever, but for now, I'm going to keep them going each week. I really enjoy seeing what everyone selects as their book, and I always love giving back to my readers. If it weren't for you guys, I'd be talking to an empty room right now. Not that that's so unusual for me, but still. The giveaway is at the bottom of this post--don't forget to enter by Sunday night (CST)! *cracks knuckles* On to the spotlight! NOTE: Titles start with YA and go down in age to picture books at the end. Sequels are usually at the bottom, but I didn't find any sequels for this week other than The Wicked King, which is so big that I've given it a spot on the regular spotlight. Titles highlighted in purple are those that received two or more starred professional reviews. The Folk of the Air, book 2. I have been on pins-and-needles waiting for The Wicked King! This is the sequel to The Cruel Prince, a story about two human sisters raised by the faerie king. I am not going to put any kind of summary here because if you haven't read The Cruel Prince the summary will give away spoilers. And trust me, The Cruel Prince is not to be missed or spoiled. Don't believe me? Just check out the reviews: Booklist, SLJ, VOYA, Publishers Weekly, and Kirkus all starred this title. That's a whopping FIVE starred reviews! STARS AND AWARDS: FIVE STARRED REVIEWS! Nina and her twin sister, Artemis, are far from normal. At Watcher's Academy, the sisters are being trained as guides for Slayers--girls gifted with supernatural strength to fight the forces of darkness. But Nina has never embraced the violent Watcher lifestyle. She prefers to follow her instincts to heal, carving out a place for herself as the school medic. Until the day Nina's life changes forever. Thanks to Buffy, the famous (and infamous) Slayer that Nina's father died protecting, Nina is not only the newest Chosen One--she's the last Slayer, ever. Period. Edited by National Book Award finalist Ibi Zoboi, and featuring some of the most acclaimed bestselling Black authors writing for teens today--Black Enough is an essential collection of captivating stories about what it's like to be young and Black in America. Seventeen contributors include: Renee Watson, Varian Johnson, Justina Ireland, Rita Williams-Garcia, Jason Reynolds, Nic Stone, Coe Booth, Tracey Baptiste, Ibi Zoboi, Brandy Colbert, Kekla Magoon, and many more. Malala's experiences visiting refugee camps caused her to reconsider her own displacement - first as an Internally Displaced Person when she was a young child in Pakistan, and then as an international activist who could travel anywhere in the world except to the home she loved. In this book, Malala explores her own story, as well as the personal stories of some of the incredible girls she has met on her journeys. These are girls who have lost their community, relatives, and often the only world they've ever known. Debut author! Sisters Lu and Min have always known their places as the princesses of the Empire of the First Flame: assertive Lu will be named her father's heir and become the dynasty's first female ruler, while timid Min will lead a quiet life in Lu's shadow. Until their father names their male cousin Set his heir instead, sending ripples through the realm and throwing both girls' lives into utter chaos. Debut author! Permafrost, book 1. As the last child in a family of daughters, seventeen-year-old Janneke was raised to be the male heir. While her sisters were becoming wives and mothers, she was taught to hunt, track, and fight. On the day her village was burned to the ground, Janneke--as the only survivor--was taken captive by the malicious Lydian and eventually sent to work for his nephew Soren. Janneke's survival in the court of merciless monsters has come at the cost of her connection to the human world. And when the Goblin King's death ignites an ancient hunt for the next king, Soren senses an opportunity for her to finally fully accept the ways of the brutal Permafrost. Debut author! Norris Kaplan is clever, cynical, and quite possibly too smart for his own good. A Black French Canadian, he knows from watching American sitcoms that those three things don’t bode well when you are moving to Austin, Texas. Plunked into a new high school and sweating a ridiculous amount from the oppressive Texas heat, Norris finds himself cataloging everyone he meets: the Cheerleaders, the Jocks, the Loners, and even the Manic Pixie Dream Girl. Making a ton of friends has never been a priority for him, and this way he can at least amuse himself until it’s time to go back to Canada, where he belongs. As a young black woman in 1880s Savannah, Essie's dreams are very much at odds with her reality. Ashamed of her beginnings, but unwilling to accept the path currently available to her, Essie is trapped between the life she has and the life she wants. Until she meets a lady named Dorcas Vashon, the richest and most cultured black woman she's ever encountered. When Dorcas makes Essie an offer she can't refuse, she becomes Victoria. Transformed by a fine wardrobe, a classic education, and the rules of etiquette, Victoria is soon welcomed in the upper echelons of black society in Washington, D. C.
On Gabriel's twelfth birthday, he gets a new bike--and is so excited that he accidentally rides it right into the path of a car. Fortunately, a Black man named Meriwether pushes him out of the way just in time, and fixes his damaged bike. As a thank you, Gabriel gets him a job at his dad's auto shop. Gabriel's dad hires him with some hesitation, however, anticipating trouble with the other mechanic, who makes no secret of his racist opinions. Born into a life of slavery, Ona Judge eventually grew up to be George and Martha Washington's "favored" dower slave. When she was told that she was going to be given as a wedding gift to Martha Washington's granddaughter, Ona made the bold and brave decision to flee to the north, where she would be a fugitive. From her childhood, to her time with the Washingtons and living in the slave quarters, to her escape to New Hampshire, this biography shares an intimate glimpse into the life of a little-known, but powerful figure in history, and her brave journey as she fled the most powerful couple in the country. In 1956, one year before federal troops escorted the Little Rock 9 into Central High School, 14-year old Jo Ann Allen was one of twelve African-American students who broke the color barrier and integrated Clinton High School in Tennessee. At first things went smoothly for the Clinton 12, but then outside agitators interfered, pitting the townspeople against one another. Uneasiness turned into anger, and even the Clinton Twelve themselves wondered if the easier thing to do would be to go back to their old school. Jo Ann--clear-eyed, practical, tolerant, and popular among both black and white students---found herself called on as the spokesperson of the group. Olive “clicks” with everyone in the fifth grade—until one day she doesn’t. When a school variety show leaves Olive stranded without an act to join, she begins to panic, wondering why all her friends have already formed their own groups...without her. As a young girl climbs the seven stories to her own (very boring!) apartment, she imagines what's behind each of the doors she passes. When the girl finally reaches her own apartment, she is greeted by her parents, who might have a secret even wilder than anything she could have imagined! The roots of rap and the history of hip-hop have origins that precede DJ Kool Herc and Grandmaster Flash. Kids will learn about how it evolved from folktales, spirituals, and poetry, to the showmanship of James Brown, to the culture of graffiti art and break dancing that formed around the art form and gave birth to the musical artists we know today. RECOMMENDED FOR: Grades K-4, but I'd buy this for middle school, too! "Misery loves company," Mama says to James Otis. It's been a rough couple of months for them, but Mama says as long as they have their health and strength, they're blessed. One Sunday before Valentine's Day, Reverend Dennis makes an announcement during the service-- the Temples have lost everything in a fire, and the church is collecting anything that might be useful to them. James thinks hard about what he can add to the Temple's "love box," but what does he have worth giving? Here's the perfect book for anyone who wants to introduce rock 'n' roll and its king to the child in their lives. In single- page "chapters" with titles like "The First Cheeseburger Ever Eaten by Elvis" and "Shazam! A Blond Boy Turns into a Black-Haired Teenager," readers can follow key moments in Presley's life, from his birth on the wrong side of the railroad tracks in the Deep South, to playing his first guitar in grade school, to being so nervous during a performance as a teenager that he starts shaking...and changes the world! A tough gumshoe of a cat--the name's Muffin--protects his territory: The Little Bear Bakery. But there are no bears here. Not on Muffin's watch. One night, Muffin hears a suspicious noise. Mouse? Raccoon? Bat? Nope, not the usual suspects. But Muffin hears...growling. Could it be? Yup. A bear. Just a cub. Whose stomach is definitely growling. Muffin's got this case solved--clearly this bear needs some donuts. January is starting off with a bang! Some great new titles to look forward to, thanks for spotlighting them! My pleasure! It's fun to put together each week, and it keeps me in the loop, too! Already working on my spring book order. Thanks for these delicious titles. Thank you for these new book ideas - so many books so little time! Wicked King looks wicked good. Checked my Brooklyn Public Library OverDrive hold on The Wicked King today--I'm #46. I was #54 originally, so I guess people dropped out of the race and just bought it. I'm into The Dark Descent of Elizabeth Frankenstein right now (OMG--so excellent! ), so for now...I'm staying strong at #46. Slayer looks amazing! I looove Buffy. So many of these are blowing me out of the water! I know my elementary students will LOVE Click, and I want to get The Roots of Rap! That's how I felt! Click is the only one on the list that didn't get at least one starred review, but I know our kids will love it. It will probably get more checkouts than any others on this list.